The Mutilator, or Fall Break as the title card tells us, is a long lost 80's slasher that has found it's way to a very nice restoration. The plot is simple: Three couples go to a beach house to spend their fall break from college. One by one they are picked off by a killer. Pretty standard slasher fare. What really sets this movie apart from other slashers are the kills and the location. The movie takes place at a beach house, which lends itself to a lot of locations that are used throughout the movie. I have seen plenty of slashers, but I have never seen one take place on a beach. The kills are the high point of the movie. Almost every kill, the exception being a drowning, is graphic and creative. The gore is not revolting, but fun. There are a few kills here that I have never seen before, which is always nice. 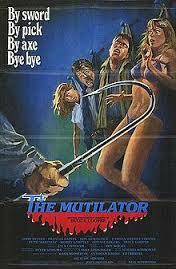 The Mutilator is a really good slasher. It is not as good as Blood Rage, which was made the same year but released two years after The Mutilator. I had a lot of fun watching this movie. Give it a shot.